Minister for Health, Simon Harris TD was on hand on Sunday April 7th 2019 in Greystones Tennis Club to take part in the club’s Open Day. The club is looking to recruit new members from under 8s to senior citizens and hopefully find the next generation of tennis stars to follow in the footsteps of locals such as Amy Bowtell and Tommy Hamilton who have represented Ireland in the Fed Cup and Davis Cup respectively. The club also informed Minister Harris of its recent Sports Capital Grant application. The club is currently installing a new state-of- the-art LED lights system and is hoping to secure funding for a court refurbishment project to ensure it continues to offer first class playing facilities to Greystones and the North Wicklow Area. Tennis is an ideal sport for all ages and levels and the club has members from age 4 to 80 who play regularly! Research shows that tennis has also been proven to lower your metabolic age and to increase life expectancy. To demonstrate how tennis really is a game for life, local Irish Internationals Odhran O’Sullivan Hamill and Ciaran Fitzgerald joined up with Conor Woods and Nadine Hennessy, who represents Ireland in the Over 60s and 70’s Category to play an exhibition match. Members of Bray Lakers were also present on the day as Greystones LTC is a proud supporter of Enjoy Tennis – which offers less advantaged groups the opportunity to enjoy the health benefits of tennis. Tennis is also one of the few sports where the gender balance is 50/50 and Tennis Ireland is a keen support of the #2020 Women in Sport Initiative. Speaking at the Open Day, Paul McKnight (Chairperson of Greystones LTC) said: “We are delighted that Minister Harris could take the time during his weekend to show his support for our Grant Application. As a father himself, it is obvious that Minister Harris can see the benefits of tennis for all ages and all elements of society. We are also particularly delighted to support Bray Lakers as part of the Enjoy Tennis initiative”. Commenting about the Open Day, Mr Richard Fahey, CEO of Tennis Ireland added: “It is great that Minister Harris could attend the Greystones LTC Open Day and to see the breadth of appeal of tennis for everyone of every age and background. Tennis Ireland is fully committed to building an inclusive sport for all society given the health and overall benefits of our sport”. 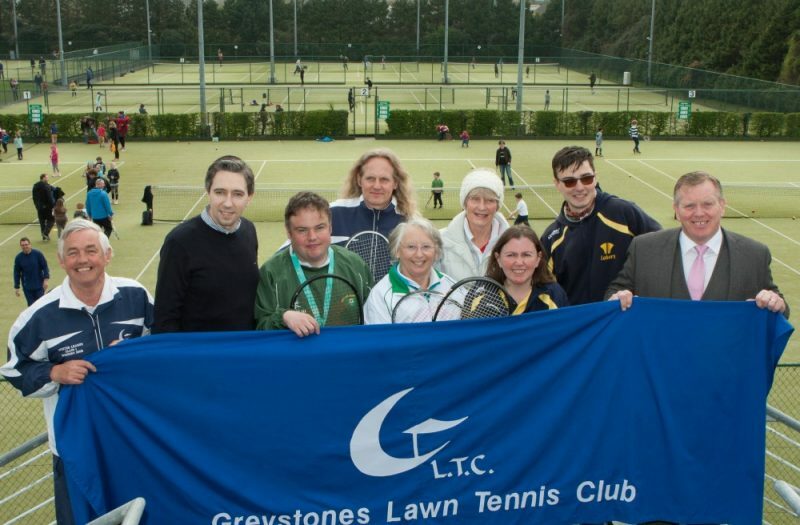 Greystones LTC offers year-round tennis to all ages through social tennis, leagues, internal and interclub competitions, coaching programmes and tennis camps. As one of Ireland’s premier tennis clubs it has 12 floodlight outdoor courts, a fully licenced clubhouse and excellent changing facilities. Greystones LTC has welcomed players of all standards from beginners to international players since its establishment in 1896.